This year marks the 50th anniversary of one of the most turbulent and transformative years in American history. While 2018 may seem chaotic, those old enough to remember know that 1968 found us a nation divided on many fronts. As the war in Vietnam raged on, protests at home reached a fever pitch, and the powder keg of America’s urban centers — long ignored or forgotten — ignited following the assassination of Martin Luther King Jr. Then, as the weary nation reeled from that tragedy, Sen. Robert F. Kennedy, brother of the president who had been assassinated only five years earlier, was slain in Los Angeles. Change emerged from this turmoil with the passage of the Civil Rights Act of 1968, including what became known as the Fair Housing Act — of particular importance to education advocates because we are keenly aware of just how profoundly ZIP code affects a student’s access to a quality education. For my parents, born and raised in the segregated South, these changes came too late to provide them with the opportunities that many take for granted today. But for them and so many others, the Civil Rights Act and various laws that followed brought the promise of better things to come. As we celebrate Black History Month, my focus is on what we have done — and will continue to do — for low-income students of color. For example, we know the dearth of African-American male educators in the classroom can have negative consequences for students, particularly for young men of color. Research continues to prove the importance of a teaching force that reflects the demographics of its student population. Students have fewer disciplinary issues and fare better on tests when they are taught by teachers who look like them, and there is a growing body of evidence that points to longer-term benefits, too. Researchers from the IZA Institute of Labor Economics point to the fact that underserved black male students are 40 percent less likely to drop out of high school if they have just one black teacher in elementary school. Now, think what a truly integrated teaching staff could accomplish. Unfortunately, our nation’s largest — and arguably most diverse — school district, New York City, has a severe shortage of black and Latino teachers. In fact, only 16 percent of the teaching workforce is black and Latino, and perhaps even more worrisome, half of the city’s white students are in schools without any teachers of color. These statistics should give us pause, especially in 2018. 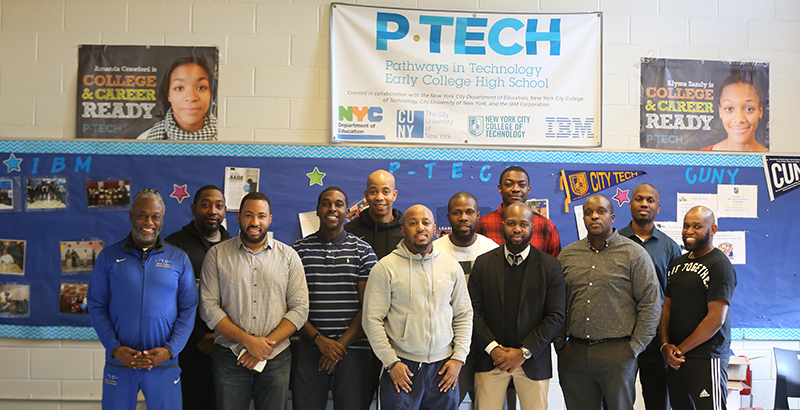 When I took on my role at P-TECH Brooklyn, an institution developed by IBM and New York educators that many have called one of the most innovative schools in the world, I moved within walking distance of the school I was about to lead. We have among the highest populations of African-American male students of any co-ed school in New York City, and it was important that the students and parents see me as a fully integrated member of their community. The same is true of talent acquisition for teachers and school leaders. Our strategy is to look to our local community for teaching talent. Education is a local issue — teachers must be able to relate to the cultural realities of their students and help them thrive. Developing talent, which may mean taking a talented coach or athletic director and helping him become a classroom teacher, is a long game, but it pays incredible dividends for students, educators, and communities. P-TECH students, virtually all from low-income backgrounds, and many the first in their families to achieve higher education, are leveraging an amazing opportunity. That opportunity is provided not only by an African-American principal, but by a teaching staff that is majority African-American and male, and that shares an unwavering belief that every student who crosses our threshold can and will succeed. Our graduates earn both a high school diploma and a community college degree, along with a pathway to employment in the highly lucrative and in-demand “new-collar” economy, which is dominated by technology. P-TECH breaks the historically entrenched barriers to high-quality science, technology, engineering, and math education that many young people continue to confront, even today. As of this fall, more than 20,000 students across seven states, from urban, suburban, and rural communities, will benefit from the model we have incubated. As with that 50-year-old promise of better things to come, there still is much hard work to be done. But our young people and communities are up to the task. It is up to us to give them the opportunities and show them the way. Rashid Ferrod Davis is founding principal at P-TECH Brooklyn.